The Glanville Fritillary, or Melitaea cinxia is a butterfly that is fairly common in Europe, but is one of the rarest in Britain, only found at a few sites on the Isle of Wight, on the Channel Islands, and in southern Hampshire. It is considered to be endangered in UK and is protected by the Wildlife and Countryside Act. 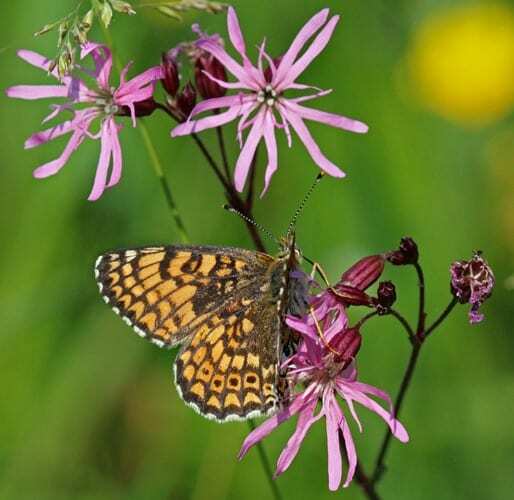 The adults fly in May, June and August, feeding on nectar from flowers including bird’s foot trefoil and thrift. The larvae only feed on ribwort plantain. We have around 50 specimens of this species in the collection, including our nominated specimen of the week L1313. Although it is rare in the UK now, it used to be more common, and became prized by collectors as it became rarer due to the changing climate. This species was discovered by Eleanor Glanville (1654-1709). 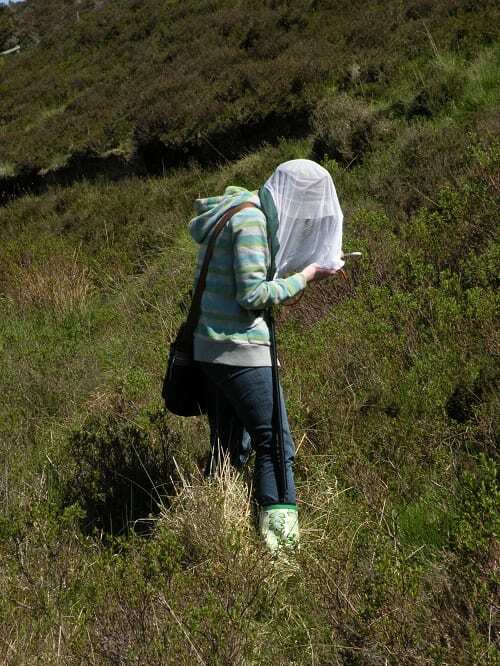 Eleanor was an early entomologist; it was considered very unusual for people to be interested in the study of insects in the 17th century, especially women. At this time women with an unusual interest in the natural world were open to accusations of madness and witchcraft. Eleanor Glanville lived in Tickenham in Somerset where her neighbours were suspicious of her behaviour. She used to get local girls to help her beat hedgerows and bushes for ‘wormes’ or caterpillars, which she would rear to adulthood to study the process of metamorphosis. She was always fascinated by insects, but she really threw herself into her entomological studies after she separated from her abusive second husband Richard Glanville. He was known to threaten to shoot his wife, and once hatched a plot to kidnap one of her children. Eleanor Glanville developed one of the finest collections of British butterflies of the day. She worked with James Petiver, an apothecary and entomologist in London, and some of her original specimens survive today in his collection which is now at the Natural History Museum in London. Eleanor discovered a new species in Lincolnshire, and presented a specimen to Petiver. At the time it was referred to as Lincolnshire Fritillary. 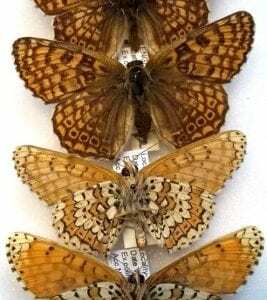 This specimen was illustrated in Petiver’s book and was the type specimen used by Carl Linnaeus when he described Melitaea cinxia in 1758. Petiver coined many of the common names for butterflies we use today such as the Red Admiral and the Small Tortoiseshell, and it was Petiver who proposed that this species be called the Glanville Fritillary in honour of its discoverer. Fortunately entomology is no longer considered a symptom of madness, and Eleanor Glanville has received some (very) posthumous recognition. There is a novel about her life and the University of Lincoln’s diversity and equality centre is named after her. Swash, Andy, Newland, David, Tomlinson, David, and Still, Robert, 2010 Britain’s Butterflies: A Field Guide to the Butterflies of Britain and Ireland, 2nd edition, Princeton University Press.